CannabisNewsWire Editorial Coverage: All eyes are on Canada and the burgeoning North American cannabis market as the flood gates open and nationwide recreational legalization north of the U.S. border throws the recent $47.3 billion by 2027 forecast from Arcview Market Research into clear relief. Already running hot at $9.2 billion last year, the North American cannabis market appears to be just getting started. Youngevity International, Inc. (NASDAQ: YGYI) (YGYI Profile) is a particularly interesting player in this space that deserves further examination considering the company’s strong logistical footprint in direct selling, the success of a shrewd and comprehensive growth model in ground coffee retail, and an established presence as one of the most trusted names in nutritional supplements. INSYS Therapeutics, Inc. (NASDAQ: INSY) has a leading position in the development of pharmaceutical cannabinoids. Developers of MARINOL, the first synthetic tetrahydrocannabinol (THC) oral solution, AbbVie Inc. (NYSE: ABBV) has been ranked in the top five on Science magazine’s annual list of Top Science Employers. Zynerba Pharmaceuticals, Inc. (NASDAQ: ZYNE) is known for transdermal cannabinoid therapies and recently reported the initiation of a first-of-its-kind clinical study using a novel pharmaceutically produced CBD targeting epilepsy and Fragile X syndrome. Cara Therapeutics, Inc. (NASDAQ: CARA) is at the forefront of preclinical work in selective cannabinoid receptor-modulating formulas that avoid interacting with receptors in the central nervous system. CBD from sources such as industrial hemp, which would be legal to cultivate in the United States under the new Farm Bill currently being considered, could post growth that eclipses that of the broader cannabis space. A strong driver here is the mounting laundry list of proven health benefits of CBD. Youngevity International, Inc. (NASDAQ: YGYI) recently announced the launch of two new organic hemp-derived cannabidiol products designed to be used with the company’s proprietary portable water-filtering bottle system. HempFX™ Hydration™ — Sleep has added melatonin and promotes healthy sleep patterns naturally, while HempFX Hydration™ — Pure is designed to deliver 25 mg of full-spectrum CBD directly to the digestive system. These beverages are now available online and join a growing portfolio of organic CBD-based products from YGYI, including HempFX Soothe™ for achy joints and muscles; HempFX Uplift™, which is designed to naturally elevate mood and promote overall health; and HempFX Relax™, which is packed with a wide variety of sleep-supporting botanicals. The meteoric rise in YGYI’s share price in recent weeks to a high of $16.25, nearly triple the preceding trend of several years, was pared somewhat due to broader market declines, leading to an $11.47 close the week ending Oct 19. However, the market mini-correction in the latest FOMC meeting, where a steady and largely anticipated diet of gradual rate hikes was indicated, appears to have blown off most of its steam according to many analysts, including those at J.P. Morgan who see a reversal on the horizon as earnings season begins. The current situation could present a nice buying opportunity, should the recent upward trend again find traction. Q2 2018 saw a 6.6 percent increase in revenues for YGYI to $44.3 million, led by a 23.7 percent jump in coffee sales. With 83 percent of total revenues coming from direct selling (up 3.7 percent) and the remainder coming from coffee, news that the company is boldly entering the CBD market has set some analysts’ mouths watering. The company’s coffee-roasting segment, run by wholly owned subsidiary CLR Roasters, has seen tremendous success with its high-energy, fat-burning JavaFit line of gourmet coffees as well as the increasingly popular Café La Rica and Josie’s Java House brands. 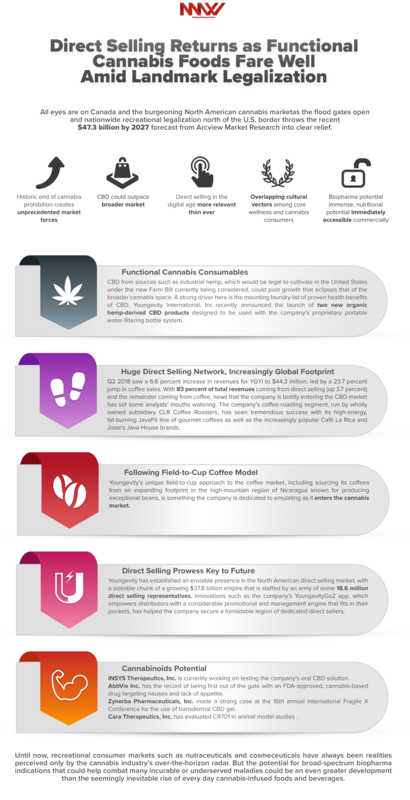 The same kind of combined marketing, distribution, sourcing and branded product expertise YGYI has demonstrated in mastery of the coffee game could put investors in the pole position as the company goes cannabis, especially amid a political environment where antiquated regulations are hastily going up in smoke. In a deal further cementing YGYI’s foothold in the hospitality market, the company recently signed a massive new deal with a major operator in the cruise line industry that will put YGYI’s coffees in the bellies of the entire crew of a 60-ship fleet, as well as those of passengers on three luxury cruise ships. Youngevity has quickly built out a comprehensive coffee revenue pipeline encompassing green coffee distribution, private-label roasting and sales of owned brands, significantly enabled by an existing direct sales matrix of high-value relationships. This direct sales network is backed by an increasingly sophisticated web platform, which is helping YGYI’s expansion into global markets proceed apace of expectations. Youngevity’s unique field-to-cup approach to the coffee market, including sourcing its coffees from an expanding footprint in the high-mountain region of Nicaragua known for producing exceptional beans, is something the company is dedicated to emulating as it enters the cannabis market. From the CLR Roasters plantations in Matagalpa, Nicaragua, to the company’s state-of-the-art 40,000-square-foot roasting, grinding, packaging facility and headquarters in Miami, Youngevity has mapped out a field-to-cup coffee bean road show that has met unparalleled success. With an abundance of cultural overlap among the company’s highest priority consumer segments and a solid reputation with nutraceutical and healthy lifestyle consumers, YGYI is leveraging both its assets and experience as it migrates into functional cannabis foods. Looking at its overall nutritional product assortment, the company seems to understand the importance of high-quality raw materials as it relates to developing brand loyalty among these highly sought-after demos. Youngevity has established an enviable presence in the North American direct selling market, with a sizeable chunk of a growing $37.8 billion empire that is staffed by an army of some 18.6 million direct selling representatives. Innovations such as the company’s YoungevityGo2 app, which empowers distributors with a considerable promotional and management engine that fits in their pockets, has helped the company secure a formidable legion of dedicated direct sellers. With such a robust direct selling model that spills over into e-commerce and social selling, it should come as no surprise that Youngevity’s CEO Steve Wallach was recently appointed to the board of directors at the 200-plus member Direct Selling Association. The merger of direct selling and cannabis could be a showstopper, and many investors are looking to YGYI to be where the rubber meets the road. The nutraceutical and cosmeceutical potential of cannabinoids is reinforced by the rapidly developing clinical and preclinical pipelines of a wide variety of companies that are looking to commercialize indications targeting everything from sleeplessness and anxiety to epilepsy and cancer. INSYS Therapeutics, Inc. (NASDAQ: INSY) is currently working on testing the company’s oral CBD solution in the treatment of neurocognition and neuroimmune response, as well as eating behavior and other symptoms. Such work in early psychosis adds considerable weight to the studies announced earlier this year, which are using CBD to treat the symptoms of severe childhood autism. INSYS is also continuing to support ongoing efforts to study CBD as a treatment for cocaine dependency. AbbVie Inc. (NYSE: ABBV) will always have the record of being first out of the gate with an FDA-approved, cannabis-based drug targeting nausea and lack of appetite among chemotherapy and AIDS patients. The company continues to be a contender in the space, due to the abundance of in-house expertise and facilities, where the company is forging a new path to the treatment of autoimmune diseases. Zynerba Pharmaceuticals, Inc. (NASDAQ: ZYNE) made a strong case at the 16th annual International Fragile X Conference for the use of transdermal CBD gel. Its compelling and statistically significant data could be a winner for the company and could come to represent a frontline approach for alleviating the common observable behaviors Fragile X syndrome presents among children and adolescents. Cara Therapeutics, Inc. (NASDAQ: CARA) has evaluated CR701 in animal model studies where it showed a significant reversal of enhanced pain response (hyperalgesia) and the kind of predisposition to increased pain sensitization and neuronal response to pain (allodynia) experienced among fibromyalgia patients. CARA has a considerable depth of knowledge in kappa opioid receptor science when it comes to treating chronic and acute pain, as well as disease-related itching, with indications like CR845/difelikefalin and KORSUVA, now both in Phase 3 clinical trials. Until now, recreational consumer markets such as nutraceuticals and cosmeceuticals have always been realities perceived only by the cannabis industry’s over-the-horizon radar. But the potential for broad-spectrum biopharma indications that could help combat many incurable or underserved maladies could be an even greater development than the seemingly inevitable rise of every day cannabis-infused foods and beverages.